Infant car safety seats can—and do—save newborns' lives in traffic accidents. In fact, you can’t leave the hospital without one. However, these seats, which require infants to be placed in an upright position, can also cause breathing problems when babies sleep in them, according to a study in the journal Pediatrics. The seats can compress the chest wall and reduce airway size, which could result in lower oxygen levels in the blood, the researchers found. MONDAY, Aug. 24, 2009 (Health.com) — Infant car safety seats can—and do—save newborns' lives in traffic accidents. In fact, you can’t leave the hospital without one. “Car seats and car beds can result in mild respiratory compromise in about 20% of newborns,” explains lead researcher T. Bernard Kinane, MD, the chief of pulmonary pediatrics at Massachusetts General Hospital, in Boston. “These safety devices should only be used for protection during travel and not as a replacement for a crib.” A car bed is a special type of car seat used for premature infants or newborns that are at risk of breathing problems. Many parents think of car seats as a cozy spot for kids to sleep, even outside of the car, because they're so easy to use, says Selena Silva, the program coordinator at the Child Passenger Safety Program at Children’s Hospital, in Denver. In the new study, 200 healthy newborns spent 30 minutes in a hospital crib, 60 minutes in a car bed, and 60 minutes in a car seat. The infants had lower oxygen levels when in the car seats and car beds than when they were sleeping in hospital cribs. Specifically, the infants had an average oxygen saturation level of 95.7% in a car seat, compared with 96.3% in a car bed, and 97.9% in a hospital crib. The researchers repeated the experiment for two-hour sleep intervals and got similar results. Dr. Kinane believes it would be a good idea to redesign infant car seats so that they do not cause chest compression. His idea? “New buckles and a new back to allow the head to fall back,” he suggests. When it comes to car-seat safety, the recline angle of the seat is crucial, says Silva. As part of her job, Silva checks the angle of every car seat, as well as the heart rate and oxygenation levels of every newborn discharged from the neonatal intensive care unit at her hospital. “We believe in it so much that it’s part of our procedure,” she says. “A doctor will specify whether the newborn passes or fails, and there is equipment such as car beds that can be utilized to address any issues if they should fail." Each car-seat manufacturer specifies the appropriate reclining angle for its seat, so if the product is installed correctly, it should help keep the child’s airway open, Silva says. 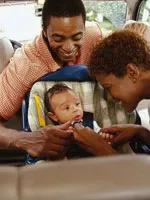 In general, an infant car seat should sit at a 45-degree angle to prevent the baby from slumping and to keep his or her airway open, she explains. This is also the angle at which the seat has been crash-tested, according to Silva. “Read the owner’s manual and only use these seats for travel," she advises.